Ok you got me! I did say an annual meet, my clubs annual meet and again if they let me shoot it and my score doesn't count and I don't get a trophy and my club got my entry fee what is the harm! My club in South Florida, not the Fl regional shoot in Orlando. So as long as you feel vindicated Allie and I sm sorry. But you didn't take back where I was saying that everyone at all the SASS shoots don't have to follow the rules either and we both know I didn't infer/say or subscribe to that did I? Well, of course Evil Roy gets a small percentage of every ER gun sold by Cimarron. That is not against SASS rules. Also there is nothing that I know of that says a shooter cannot be sponsored, as long as he/she doesn't advertise on their person. This is what the Shooter's Handbook says: "The displaying of any manufacturer’s, sponsor’s, or team logos on apparel. (Manufacturer’s labels on such apparel or equipment are acceptable)"
I guess you missed part of this discussion. Those grips that were on the original Rooster Shooter had very small grooves and were determined to not be a competitive advantage and so were okayed. Later, Cimarron switched to a different vendor and the grooves got deeper. It would open a can of measurement worms to rule that the original Cimarrons are okay but not the current ones. Plus there are plenty of aftermarket grips similar. So the simplest thing was to just outlaw them all. 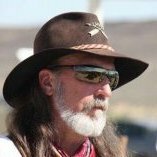 As for Cimarron needing to "get rid of" (my quotes) the Rooster grips because they are no longer SASS approved, well the fact is that the majority of these guns (as well as Man With No Name, etc) are bought by non-cowboy shooters. The grooves on the newer cimarron and after market grips got deeper because the original cimarron rooster shooter grips got it wrong. 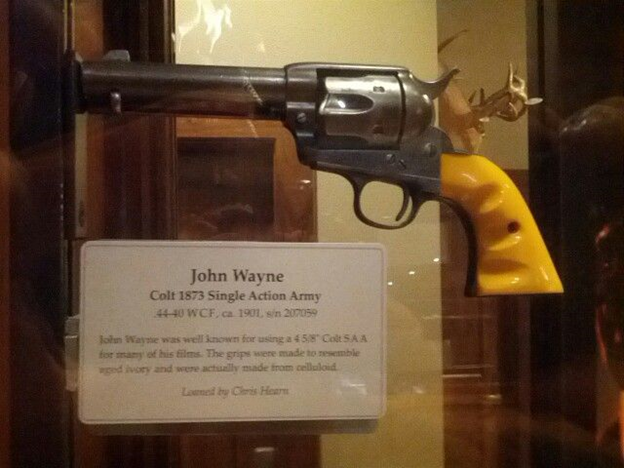 The original's weren't deep enough, as you can see in the photo I posted of John Wayne's real gun. They didn't get deeper because there was this competitive run started with the original version opening the door. You didn't see this horde of shooters trying to exploit a loop whole. It's a red herring and a really poor excuse used to keep illegal equipment used by arguably the most iconic western legend of all time. It seems that the whole lowered hammer incident(s) instilled enough fear in the powers that be to not even want to have to deal with it again, no matter how remote the possibility may be. Casting aspersions on the "powers that be" is an extremely bad move if the intent is to attempt another run at getting the rules changed to allow "finger-grooved" grips. "Personally, I wouldn't risk it." "I really don't see that happening,..."
"As with the hammer issue, once we allow one type of modification, it becomes harder to justify denying other variations." At this point, requesting any further consideration would most likely be an exercise in futility. That's a bit like my telling my son that if he don't behave he isn't getting a cookie. And then telling him we are out of cookies and I don't plan on making any either. I am sure you are right, though. I have no intentions of casting aspersion toward you. You have been nothing but helpful to me throughout this process. But if I have learned anything from the wire, it's that given enough time and enough people making noise, changes do happen. Total time scoring and dropped round rule come to mind. I am still one of the younger cowboys out there, so I have time. ...I am still one of the younger cowboys out there, so I have time. You mean you're under 60? i don't begrudge anyone getting rewarded for their hard work. I have been in the sport a little longer than you and have seen what I feel are modifications that do assist shooters competitively and the amount of people who would buy grips with finger groves no matter how deep would not be adopted by a large percentage of shooters to be a major factor of competition as havebthebadoption of dhortbstrokevsdoption in 73s! 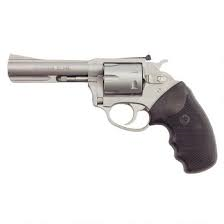 And I am sure that there would be a lot more gunfighter grips than finger grove grips! So let the few people in the game buy finger grove grips no matter how deep because as was said above most people who buy the Rooster and man with no name pistols are not participating in our sports, just like there are few of us who shoot with a large loop! Everybody tells me that I am not competitive shooting that rifle but no one can say that I don't have a big smile on my face when I do! You just gave me an idea, Nimble. A new rule change that allows the use of John Wayne finger groove grips, but only if you are using a big loop lever too. This way whatever supposed competitive advantage the grips have are negated by the disadvantage of the big loop lever. You think it’ll fly? You still cannot. What I quoted was from the Outlawed List. Sorry I did not make that clear. Ok that's what I thought but really haven't paid attention. But I have seen advertisements for certain bullets listing winning shooters in their ads, Meiser? Bullets! So what? I don't care let any modification in and let the marketplace decide. I am curious, what came first the chicken or the egg? Did shooters start to have their rifles short stroked and then the kits got approved or did the various vendors submit their kits for approval first to SASS. I am thinking there are at least 2 kits, please correct me if I am wrong? Same thing with the Riger Pawl kit that allowed the cylinder to go both ways for easier reloading on the clock, installed in a few pistols and shot in tournaments before receiving SASS approval? If if they were used before approved it would kind of constitute not following the equipment rules? Anyway just wondering if these modifications were approved before they were used in the SASS sanctioned shoots. Hmmmmmm? There has never, as far as I know, been restrictions on internal modifications. IIRC the first short strokes were not kits, they were Cody and Lone Dude(?) modifying by cutting and welding. Then others began to make parts and the race was on. Whatever the process was at the time was invoked, the short strokes looked at. A determination was made that it would be OK, but to put limits on how short the throw could be. There are specific restrictions on target grips. And the Rooster Grips and any with finger grooves have now been ruled to be one in the same as target grips. I shoot two of the originals. 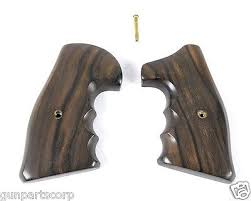 The grooves are the same on both guns, so the left hand and right hand find the grooves opposite of each other. Now, what will I do? I am convinced there are shooters who just want to cause a stink. 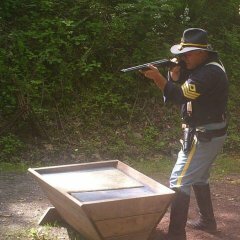 I am going to refuse to shoot with some folks, because they are better than me and want to continue to beat me. (HA) Can I get some gunfighter grips, or stag, or ivory, or walnut, or rosewood, or checkered, or scrimshawed, or boar tooth, or duck tape wrap?? Why ask me? I just read PWB's post and other rules. I have absolutely no say in ROC clarifications. I have yet to see proof that those original grips on my two Roosters are a competitive advantage over others. My head is a seasoned rock. Please explain my advantage over others. It doesn't matter whether it gives you or anyone else an advantage. There are specific restrictions on target grips. And the Rooster Grips and any with finger grooves have now been ruled to be one in the same as target grips. Ergo they are not legal. Another example of ruling by hearsay without scientific proof. All the other techniques are worse than a pair of grips. They are not even built like target grips. I am a still a p*****d Rooster man. Not even getting into the competitive advantage or safety aspects since I've never actually tried these grips. Fargo Bill! 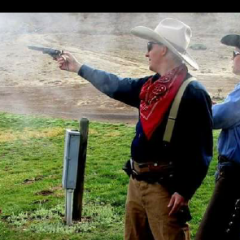 What the heck are you doing competing with 2 Rooster pistols??? Didn't you see where Abilene stated that a majority of those pistols would be bought by non cowboy shooters! You must be in the minority, just like any of our other pards who have the man with no name Navy conversions! If I knew how to do one of the polls here I would to see how many SASS shooters owned either model. I am all for a petition to have those grips exempted from the definition of "target" grips. This is a very good point. What exactly are target grips? No where in any of my google searches did I ever find a target grip that had grooves on one panel only. Also worth noting is that when you do a google image of target grips, the vast majority brings in standard grips with checkering. Will checkering be the next to go since it is considered by many to be target grips? Thanks again. This is quite interesting as most political-like decisions. Who started this change anyway? Must have been one person at onset. Please let me know if you are out there or anyone who knows let me know. I guess I can take the blame for that. 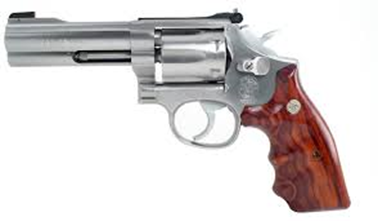 I submitted the request to have all John Wayne style grips allowed, not just the rooster shooter ones. I thought my arguments were pretty compelling. I hadn’t anticipated the ROC would find it so compelling to rule all finger groove grips illegal. So Fargo Bill I’m the guy to lynch. Sorry about that. Our brilliant committee never thought of that I bet. Since I will have to change my grips I will gladly accept receipt of two pair of one-piece plain white or stag grips that will fit my Roosters. One of mine has one-piece without screw and one has the screw added to the one-piece. I am just too destitute for this added need in order to compete without infringing on the rules. I cannot bear to have an unfair advantage over my fellow shooters. Just get some JB weld and fill in the finger grooves. That should be OK, right? You've heard the phrase "walking on thin ice." That is what I consider insulting the ROC to be. I don't love every decision they make; but I respect them for their efforts at making our beloved sport's rules fair and consistent. There are polite ways to disagree with a decision, you should try politeness instead of sarcasm. It will get you farther in having your views accepted worthy of consideration. I apologize to anyone I offended and will not be sarcastic anymore. How can I politely request review of rule change by ROC? I would send a message to Headquarters. They will forward it to the appropriate person(s). Hey Fargo, let me know if you need an additional voice requesting or a petition signed to assist your side. I haven't purchased a pair yet by as I said above love anything John Wayne attire or accessories. I will be happy to jump in and do whatever I can. I have a few friends that are on that committee and it is a thankless job! Give them a little bit of a break. You can never make everyone happy. ... You can never make everyone happy. John Wayne characters are not allowed in B-Western. Also, costumes that depict leading role characters in B–Western movies are allowed as long as the costume is complete with all accessories, but the costuming must still adhere to the boot, leather, spur, hat, and firearm requirements above. John Wayne, spaghetti western, and townsperson characters are not acceptable. I was almost run off the Wire for making the prediction that this would happen, seven or eight years ago.